To me, nothing says “Springtime” like fresh asparagus! Yes, it is available just about all year but in Washington State the grocery stores and produce markets have an abundance of these strange looking stalks. I love these guys, they are low in calories, low in carbs and zero fat. 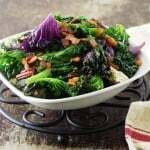 They are also high in fiber and vitamins, as well as inflammatory/antioxidant properties. And, they taste so good! Recently, Don and I attended our first-time-ever Passover Seder dinner. It was held at our church and was catered by a company in Seattle called, On Safari Foods and they served 150 of us! It was a wonderful meal and experience. Included in the meal was room-temperature, roasted fresh asparagus, which was very delicious. 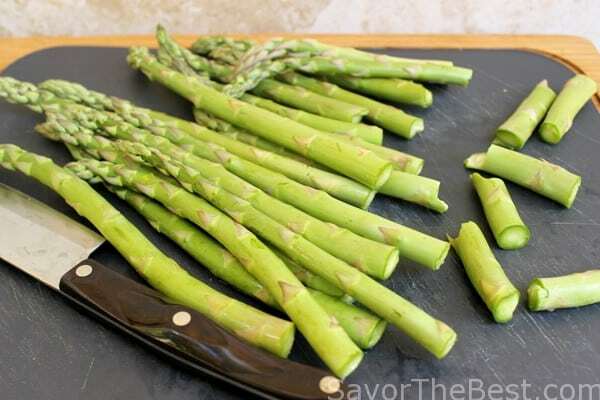 When I prepare roasted asparagus I usually serve it hot, right out of the oven but it was really good at room temperature so the following recipe will reflect that. I asked one of the caterers how they prepared their asparagus and it is almost exactly how I prepare mine. The difference was I roast mine at 400°F for 8-10 minutes and they roasted theirs in their pizza oven for 5 minutes which is much hotter. I roasted these at 500°F for 5 minutes and they were perfect. 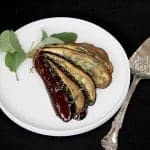 There is also an advantage of having these at room temperature as it can be prepared earlier in the day and it frees up the oven and your time. 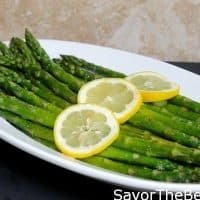 What really puts this easy asparagus dish “over the top” is squeezing that fresh lemon on right after it is in the serving dish. Oh, so good, so healthy and good for your bod! 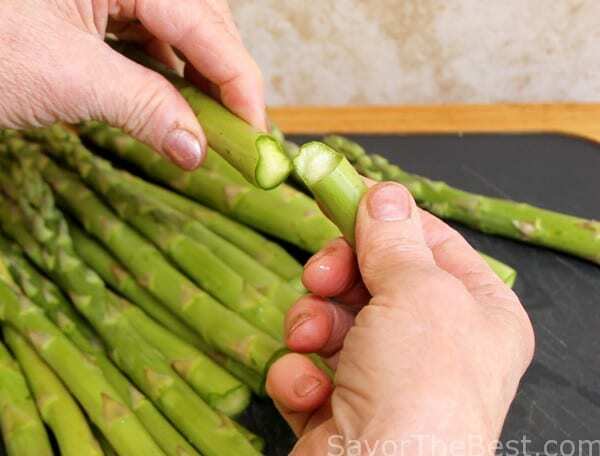 When buying fresh asparagus I just breeze past the little skinny pencil-thin bunches as they will not have much flavor. The thicker stalks are much more flavorful. I added this roasted asparagus dish to our Easter Dinner menu. 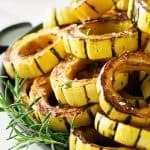 Roasted vegetables are great side dishes, we are sure you will love these. 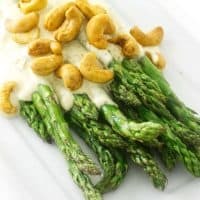 Crisp but tender aspargus is topped off with a spicy low-fat curry sauce and sprinkled with toasted cashews. Simple but so flavorful! 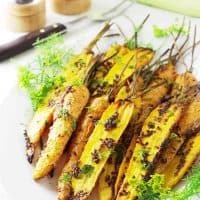 Mustard-dill carrots are an amazing side dish to any meal. 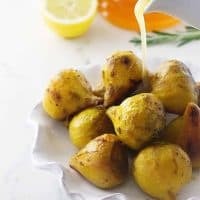 Golden Beets are naturally sweet and the honey lemon glaze brings that sweetness out along with a zesty tang. Crisp roasted asparagus served at room temperature, and drizzled with fresh lemon juice. Break off the tough ends of the asparagus and discard, place the asparagus stalks in a zip-top bag and add the oil. Gently, roll the asparagus around to coat evenly. Remove the asparagus and spread in a single layer, on a baking sheet. Transfer to the upper rack of the oven and roast the asparagus for 5 minutes. Remove the asparagus from the oven and transfer to a serving plate. They will be bright green, tender and crisp. Sprinkle with salt and squeeze lemon juice over them. Garnish with the lemon slices. Oh, I love to roast asparagus! It’s so good, isn’t it? Lovely pictures and post — thanks so much. 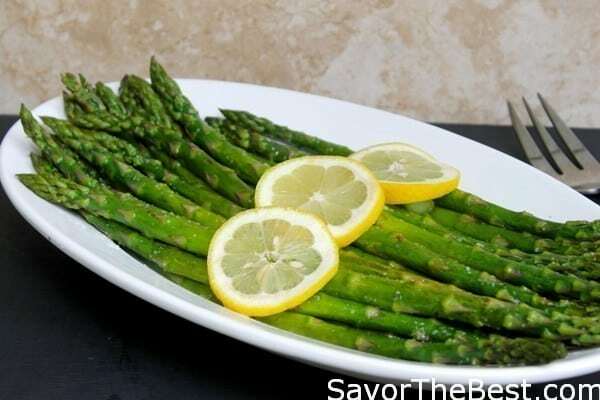 I love asparagus and even though I find it all year long, it’s SO great in the spring! Great tip about the ziploc bag ~ use less oil and get them evenly coated. Genius!